This was my third year of taking part in Me Made May, and probably the most challenging yet, what with having a baby part way through! Yes, I’ve had to deal with going from a pregnant belly to a post-baby body, and was already struggling with a very limited selection of clothing that fit me, let alone me-made clothing that fit. In the end I did fulfil the pledge, with the exception of the day I gave birth when I didn’t wear any me-mades at all (but I’d made a baby!). I didn’t get all that many photographs, though, for various reasons I’ll go into. First, though, I’m going to share the ones I did take. Day 1: the only me-mades here were my striped Erin skirt and a polka dot headband, but I really liked the overall outfit. Day 2: really chilly start to the day, so layered up my Agnes/Neenah dress with a Drop Pocket Cardigan. Not a great look, but it kept me warm! Day 3: Much warmer, so I wore my Amber dress. Day 4: My floral Agnes top got its final outing over the bump! This picture was taken about half an hour before we left for hospital, so please excuse the ropiness. Day 5: I got one last pic of the bump in the hospital garden, while being induced. The weather had turned absolutely roasting! Wearing a self-drafted jersey maxi skirt I’ve never blogged, which I normally only wear around the house as it’s gone quite bobbly. Super comfy, though! 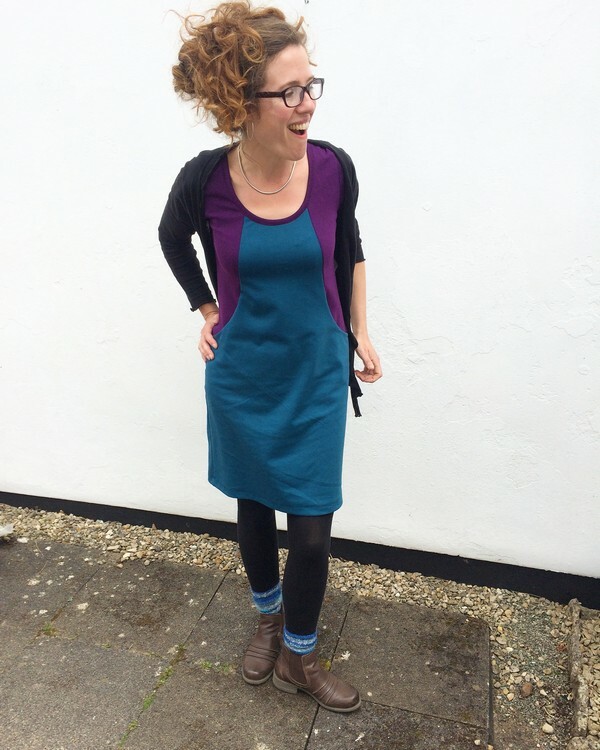 Day 7- back home, and trialling my Colette Wren dress over my deflating tummy. Really comfy and lovely in the heat, but didn’t cover my bust adequately. Would need an FBA to wear this pattern at the moment! Day 8 = a bit cooler, so I wore that Drop Pocket Cardigan again, with a me-made jersey scarf. Day 21 – bit of a jump in time here! I’m wearing my Erin skirt again, with a self-drafted hacci kimono. Also wearing Lauren! 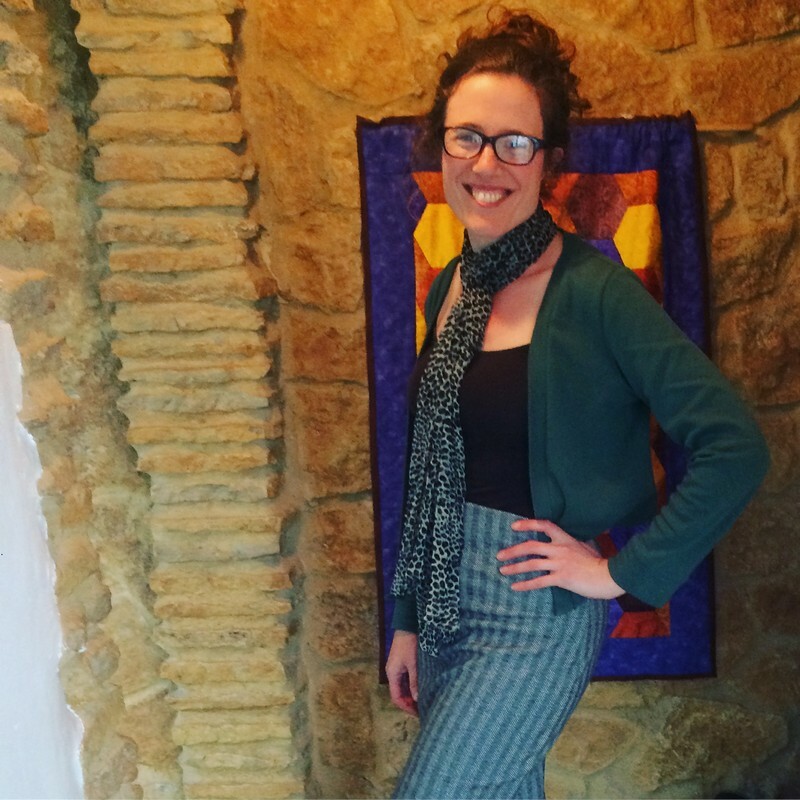 Day 22 – An old broomstick crochet cardigan (pre-blog), with a me-made headscarf. Day 26 – Demonstrating how easy it is to feed Lauren while wearing my pink tee from the Craftsy Sewing with Knits class (affiliate link). Also wearing the Erin skirt again. So, that was the outfits I documented. The other days I wore pretty much the same mix of garments, which was why I didn’t feel particularly inspired to get photos. But there were other reasons the photos didn’t get taken too. I lost my favourite photo locations, because Andy has been digging up the patio to join in the ensuite in our new bedroom (garage conversion) to the existing waste system. There are slabs up everywhere and quite frankly my entire courtyard is a mess and doesn’t make an attractive backdrop. I could have taken indoor pics by the door and window I usually use (see the first four days above! ), but that would have meant tidying the floor and vacuuming. I just didn’t feel much like that with a newborn to look after. Admittedly, the box of winter clothes also contains gloves, hats and scarves belonging to the rest of the family, but I was still amazed at how many of my clothes I can’t currently wear (there’s another under-bed box of too-small clothes, but ones I reckon I’ll fit into first as they’re probably a size UK 12/14 rather than the size 10 that went into the loft). I don’t remember it being this bad after having Gabriel, but I suppose it was winter then, some of the clothes I wore then have worn out and are no longer with me, and much of what I’ve sewn since then is small and close fitting. That’s not all my clothing. I have scarves and bulky cardigans on the top shelf there, and I keep camis, tees and lightweight cardigans in my bedside drawers, along with undies, lounging clothes and workout gear. Still, I think it’s fair to say that my current selection of clothing I can wear is extremely limited and I’m bored to tears with it all. There’s lots of plain black and very little variety in styles. I’m stuck with a small selection of RTW jersey breastfeeding dresses or camis and maternity skirts. Yay. I know that this state of affairs won’t last forever. I will get back to my old size (I’ve managed it twice before!) but it’s going to take time and exercise, along with sticking to healthy food and not overdoing the carbs. I’ve just started week one of the Couch to 5k to get me back into running gently, so I reckon I’ll be in the size 12/14 clothes in a month or so, and hopefully back to my old size by the end of the year. Any clothes I make now will need to work for a variety of sizes, or be easily adjusted when I lose weight. FWIW, I feel I should point out here that there’s nothing wrong with having a “mum tum”, and I know many women never get back to the size they were before having a baby (took me 7 years after Daisy!). However, I would prefer to get back to the size I feel happiest and healthiest at, and I know it’s achievable as I’ve done it before. 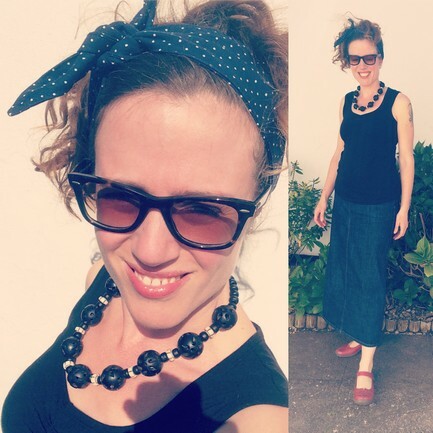 Maxi skirt – I definitely want one in black, in a lightweight swishy woven viscose. I’m thinking a simple elasticated waist would be best. You can get waistband elastic that’s designed to be exposed, and I might go for that. Should be a super fast sew that way! If that goes well, more maxi skirts in patterned fabrics would be great. 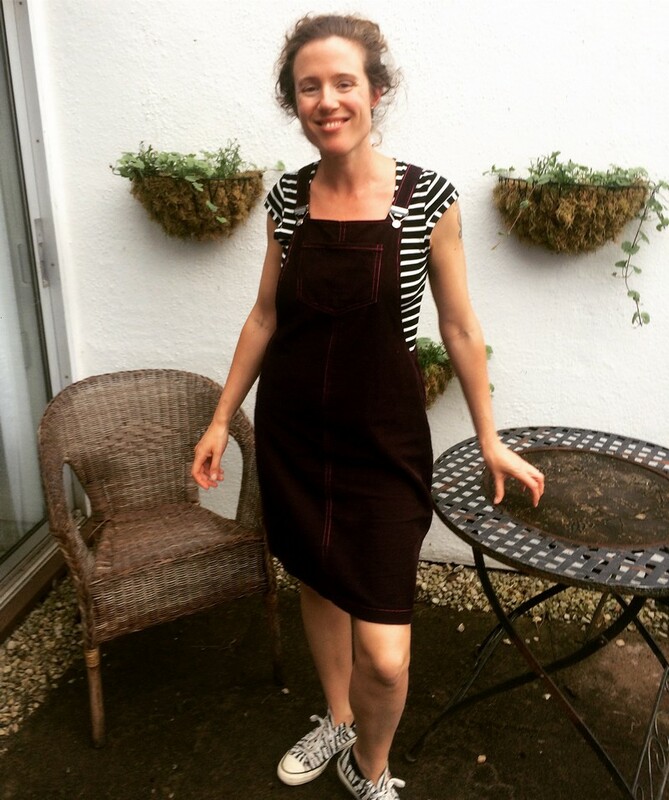 Dungaree dress – Something lightweight again. Possibly in dark chambray or a deep plum colour. I like the look of the new pattern from Helen’s Closet, but might draft something myself as money is tight and I hate assembling pdfs. 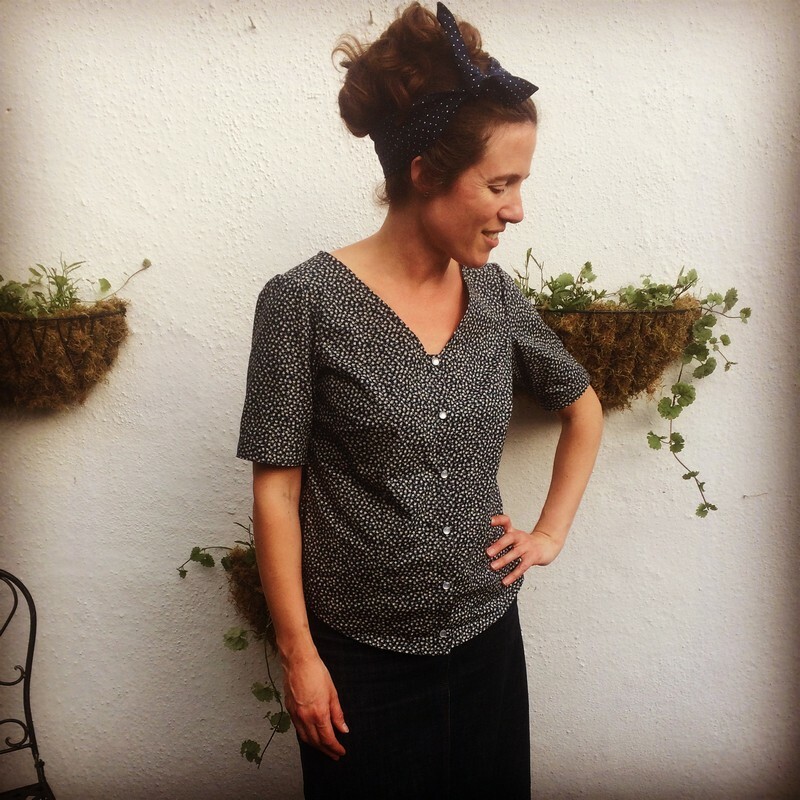 Looser fitting tees – until I lose the baby tum these are what I want to wear! Perhaps just a couple: one plain (plum?) and one striped or polka dotted. I could use the Deer and Doe Plantain tee as that’s close fitted at the top, but looser over the waist and hips. Tropical print kimono – Something lightweight with a colourful but dark background print. For a bit of fun, and an easy way to add some colour to my current all-black outfits. I could draft this myself. Another Amber dress or two – prints, this time! Polka dots, tropical florals, bright colours. Something to cheer me up. So, that was my Me Made May, and it was fairly challenging! Did you take part? If so, what did you learn about your handmade wardrobe? I wasn’t sure if I’d be taking part in Me Made May this year–after all, my due date is May 9th so I’d be spending part of the month heavily pregnant, then giving birth, then dealing with a newborn (plus a three-year-old and a twelve-year-old). Let’s face it, I probably don’t need any more pressure! But then I remembered how much I’ve enjoyed the challenge the last couple of years, and that it’s a personal pledge with no obligations to up the ante each year. I’m keeping my pledge really simple, and hoping it will encourage me to spend just a little time on myself each day (easy to forget to do with a newborn around) and to help plan my summer sewing. Maternity clothes that can be altered for future non-maternity use. Maternity clothes for donating to a charity shop. In previous years I’ve managed to get a photograph of my outfit each day, but that might not happen this year. However, I’m hoping I can at least get a quick selfie most days, even if it is with a sleeping baby on my lap! I’ll share those on Instagram, and do some kind of round-up post here at the end, although it probably won’t be as comprehensive as my posts in previous years have been (here’s the final posts for 2016 and 2017). Right, that’s me. Are you taking part in Me Made May this year? If so, what are your goals? Wow, what a Me Made May it’s been! Only my second year taking part, but I’ve learned a huge amount about my style preferences, my wardrobe gaps and about taking better pics. Here’s this years’ posts in full: Pledge, Week 1, Week 2, Week 3, Week 4. And to wrap it all up, here’s the last few day’s outfits, followed by some general thoughts on the whole month. This has been a weird week in terms of weather, with a few days of unrelenting rain, wind and now back to sunshine. Okay, probably not that odd for spring in Somerset, but still, it’s made it more of a challenge to put together new outfit combinations (see my pledge here) as not all that many of my me-mades are suitable. I’m really hoping this next week is as good as it’s meant to be so I can break out more of the summer clothing! Day 15: Tried to find a good indoor photo location as it wouldn’t stop raining! I’m in the Easy Knit Pencil Skirt again (2nd time) and the Wembley Cardie (also second time). This outfit looked quite dull until I added the chiffon scarf, which suddenly tied everything together. Well, we had a couple of glorious warm, sunny days this week, but then it got cool and rainy. I suppose I should be glad for the garden, but instead I’m wondering how I’m going to get a chance to wear the rest of my summery me-mades this month! I will endeavour to wear two me-made garments/accessories each day for the duration of May 2017 and to only wear each specific combination once during the month. I’m also planning to finish up the mother of all crochet projects by the end of May: my broomstick Rebel Lace cardie. I think I need a deadline with this one or I’ll be making it forever! That’s a bit more ambitious than last year, when I simply pledged to wear one me-made garment/accessory each day. I now have more me-mades to work with, though, and I fancy having a go at combining them in different ways. I’m hoping to find some new ways of styling my me-mades–especially the ones that don’t see as much wear. I’m also hoping that by forcing myself to wear some of my lesser worn garments, I will be able to evaluate whether they have a place in my wardrobe, or if they need to be refashioned or find a new owner. And over the month I’ll be aiming to come up with some more concrete sewing plans for versatile garments I need to fill the gaps in my wardrobe. I will be Instagramming my outfits each day (as anna_jo_sews), with weekly roundups on the blog.